Nothing impresses like a 3L bottle of Cabernet Sauvignon! In the late 1960s we bottled a few cases of Cabernet Sauvignon for friends and family. 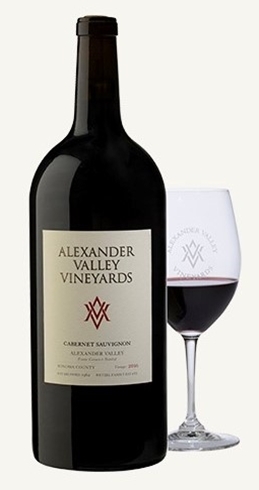 Those first few cases of homemade wine inspired the vision for our estate winery, Alexander Valley Vineyards and our flagship wine Cabernet Sauvignon. Overall, 2016 was a more normal growing season than the last few years. While the drought was still persistent, we received much needed rain over the winter and early spring. The good weather continued through the summer with no damaging heat spikes. Yields were slightly reduced, but the quality and flavor of the grapes were stellar. After harvest the different lots were de-stemmed, fermented separately, then aged in 25% new American and French oak barrels for 14 months. The 2016 Cabernet Sauvignon is a classic Alexander Valley wine with medium body, great fruit flavors and smooth, structured tannins. Winemaker Kevin Hall added 13% Merlot for structure, a touch of Cabernet Franc for floral notes and Malbec and Petit Verdot for color. There are aromas of black cherry, cassis, plum, slight blueberry, vanilla, oak and chocolate. In the glass there are rich flavors of cherry, cassis, blackberry and chocolate. This is a fruit forward wine with lush flavors, nice balance and a long, silky finish.